Here are some snazzy birthday facts about 1st of August 1968 that no one tells you about. Don’t wait a minute longer and jump in using the content links below. Average read time of 10 minutes. Enjoy! What day was my birthday Aug 1, 1968? August 1, 1968 was a Thursday and it was the 214th day of the year 1968. It was the 31st Thursday of that year. The next time you can reuse your old 1968 calendar will be in 2024. Both calendars will be exactly the same! This is assuming you are not interested in the dates for Easter and other irregular holidays that are based on a lunisolar calendar. What day is August 1 this year? There are 103 days left before your next birthday. You will be 51 years old when that day comes. There have been 18,524 days from the day you were born up to today. If you’ve been sleeping 8 hours daily since birth, then you have slept a total of 6,175 days or 16.91 years. You spent 33% of your life sleeping. Since night and day always follow each other, there were precisely 628 full moons after you were born up to this day. How many of them did you see? The next full moon that you can see will be on May 18 at 21:13:00 GMT – Saturday. Fun stat: Your first one billion seconds (1,000,000,000) happened sometime on April 9, 2000. If a dog named Uhaul - a Flat-Coated Retriever breed, was born on the same date as you then it will be 245 dog years old today. A dog’s first human year is equal to 15 dog years. Dogs age differently depending on breed and size. When you reach the age of 6 Uhaul will be 42 dog years old. From that point forward a medium-sized dog like Uhaul will age 4.5 dog years for every human year. View the complete list of August 1 celebrity birthdays. Who are the famous August 1 birthdays? Here’s a short list of famous people in history who were born on Aug 1. View the complete list of August 1 famous birthdays. What happened on my birthday – Aug 1st? Octavian (later known as Augustus) enters Alexandria, Egypt, bringing it under the control of the Roman Republic. The Speedwell leaves Delfshaven to bring pilgrims to America by way of England. George, Elector of Hanover, becomes King George I of Great Britain, marking the beginning of the Georgian era of British history. Laborer slaves in most of the British Empire are emancipated. The Lombard Street riot erupts in Philadelphia, Pennsylvania, United States. The start of the first Scout camp on Brownsea Island, the origin of the worldwide Scouting movement. Josip Broz Tito reads the resolution “Manifesto of constitutional congress of KPH” to the constitutive congress of KPH (Croatian Communist Party) in woods near Samobor. Alabama Supreme Court Chief Justice Roy Moore has a Ten Commandments monument installed in the judiciary building, leading to a lawsuit to have it removed and his own removal from office. The I-35W Mississippi River bridge spanning the Mississippi River in Minneapolis, Minnesota, collapses during the evening rush hour. The Beijing–Tianjin Intercity Railway begins operation as the fastest commuter rail system in the world. View the complete list of August 1 historical events. Curious about this Crazy Quick Fuse? This is a party item you can activate and send to your friends when you play the free game Jump Birthday Party. It’s a fun and easy-to-play mobile game for all ages. Get free 1,000 gold coins when you download today! What does my birthday August 1, 1968 mean? 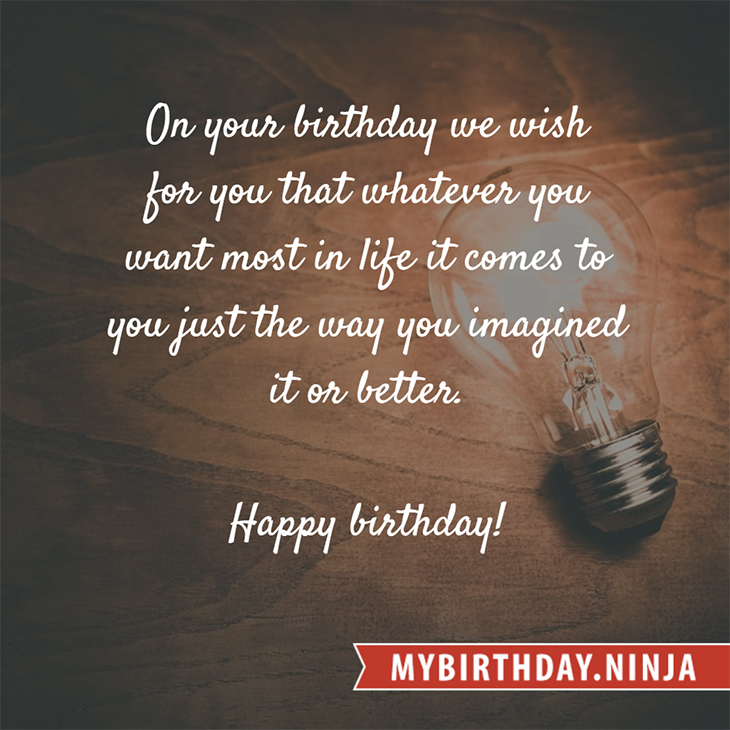 Your birthday numbers 8, 1, and 1968 reveal that your Life Path number is 6. It represents justice, nurturing and responsibility. You possess great compassion and seek to be of service to others. The following celebrities also have the same life path number: Véronique Sanson, John Paul Young, Johnny Horton, Cheryl Wheeler, Kim Sun-a, Ku Hye-sun, Lauren Graham, August Schellenberg, Patricia Quinn, Sherman Hemsley. 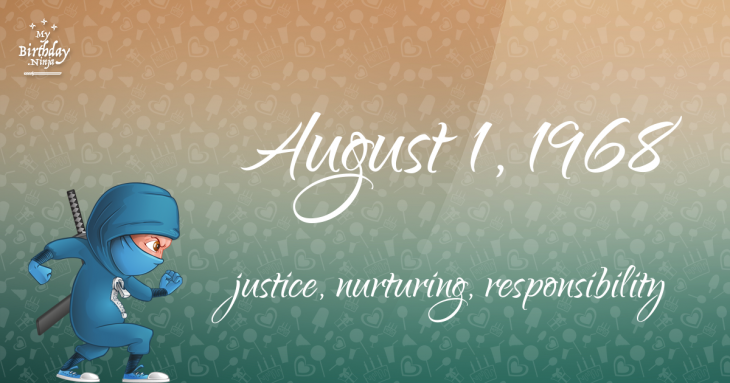 What is the birthday horoscope for Aug 1, 1968? The Western zodiac or sun sign of a person born on August 1 is Leo ♌ (The Lion) – a fixed sign with Fire as Western element. The ruling planet is Sun – the center of our universe. According to the ancient art of Chinese astrology (or Eastern zodiac), Monkey is the mythical animal and Earth is the Eastern element of a person born on August 1, 1968. What is the birthstone for August 1? Fun fact: The birth flower for 1st August 1968 is Poppy for preparedness. What is the Love Match for Aug 1, 1968? When it comes to love and relationship, you are most compatible with a person born on January 4, 1971. You have a Love Match compatibility score of +135. Imagine being in love with your soul mate. On the negative side, you are most incompatible with a person born on April 15, 1958. Your incompatibility score is -113. You’ll be like a cat and a dog on a love-hate relationship. Arf-arf, I want to bite you. Meow-meow, stay away from me! What is a good birthday trivia for August 1? The number-one hit song in the U.S. at the day of your birth was Hello, I Love You by The Doors as compiled by Billboard Hot 100 (August 3, 1968). Ask your parents if they know this popular song. I do not know how you feel about this, but you were a male ♂ in your last earthly incarnation. You were born somewhere around the territory of Italy approximately on 750. Your profession was handicraftsman, mechanic. How many babies were born on August 1, 1968? Base on the data published by the United Nations Population Division, an estimated 120,171,727 babies were born throughout the world in the year 1968. The estimated number of babies born on 1st August 1968 is 328,338. That’s equivalent to 228 babies every minute. Try to imagine if all of them are crying at the same time. What is the popular baby name on 1 Aug 1968? What’s your bizarre Florida Man story? The #FloridaManChallenge is breaking the Internet and social media. Some crazy men, women, or creatures from the Sunshine State are making headlines every day of the year including your birthday. Try this fun exercise. Pick your search engine of choice and type in “florida man August 1” and see what kind of wild news headline you will get. This viral craze started in 2013 and gets resurrected now and then. The latest was from Tumblr and found its way to Twitter. As they say, the rest is history. Here’s a quick list of all the fun birthday facts about August 1, 1968. Celebrities, famous birthdays, historical events, and past life were excluded. Try another birth date of someone you know or try the birthday of these celebrities: May 16, 1969 – Tracey Gold, American actress; October 31, 1937 – Tom Paxton, American singer-songwriter and guitarist; December 20, 1985 – Jillian Grace, American model.